ATM Anthony Thomas Melillo crewneck sweater in striped merino knit. Crew neckline. Long sleeves. Ribbed hem and cuffs. Pullover style. ATM Anthony Thomas Melillo crewneck sweater in striped merino knit. Crew neckline. Long sleeves. Ribbed hem and cuffs. Pullover style. Merino wool. Imported. Model's measurements: Height 6'1"/185cm, waist 32"/81cm, typically wears size M.
EXCLUSIVELY AT NEIMAN MARCUS Kiton heathered diamante sweater-knit polo shirt. Spread collar; three-button placket. Long sleeves; banded cuffs. Classic fit. Pullover style. Wool. Made in Italy. 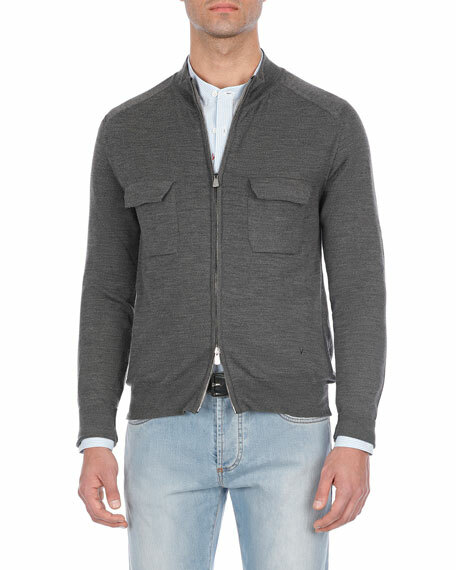 Loro Piana sweater in two-tone knit. Stand collar; half-zip placket. Raglan sleeves. Straight hem. Cashmere/cotton/nylon. Made in Italy. Model's measurements: Height, 6'1"/185cm, waist 31"/79cm, suit 40, shirt 15.5x35, inseam 32"/81cm. Peter Millar "Crown" sweater in interlock knit. Stand collar; half-zip placket. Straight hem. Cotton/modal/polyester. Imported. Model's measurements: Height, 6'1"/185cm, Suit 40L, Shirt 14.5 x 34.5, Waist 32"/81cm, Inseam 32"/81cm.